On January 16, 2018, motorists renewing their Hawai’i driver’s licenses began bearing a star in a gold circle, indicating that the license is in full compliance with new Federal guidelines. The Department of Homeland Security has mandated that all driver’s licenses used as identification to board flights and enter all Federal buildings must bear the gold star by October 1, 2020. Passports can be used as alternate identification to board flights. Note: Motorists may elect to get a limited-purpose driver’s license, which will not have a gold star, but which may ONLY be used to drive. 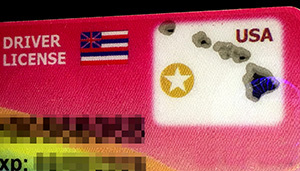 For more information on Acceptable Documents visit our website: www.hawaiicounty.gov/finance-v… . The County Division of Vehicle Registration & Licensing recommend renewing your license in the middle of the month when visiting Kona, Waimea or Pāhoa offices, to avoid peak crowds at other times of the month. No change is required at this time to currently-valid licenses.